This letter was written by Pvt. Daniel J. McVean [or McVain] of Company K, 8th New York Cavalry Regiment. Daniel enlisted in August 1862 at Caledonia to serve three years. He died of disease on 25 October 1863. 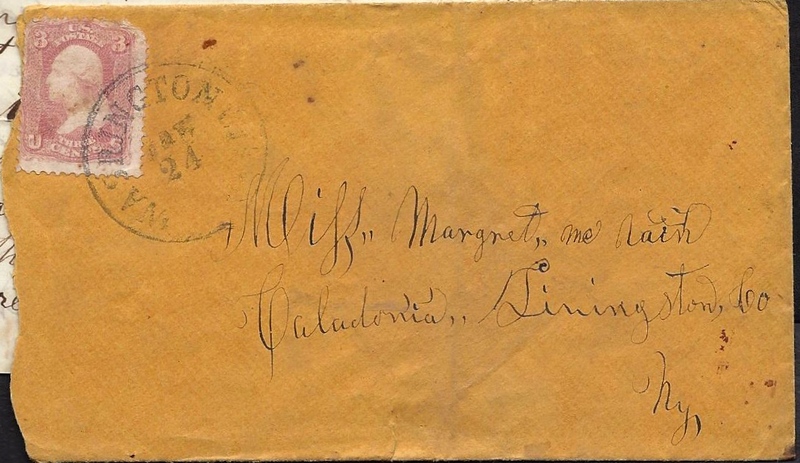 Both letters were written to his sister, Margaret, or “Mag” as he called her. 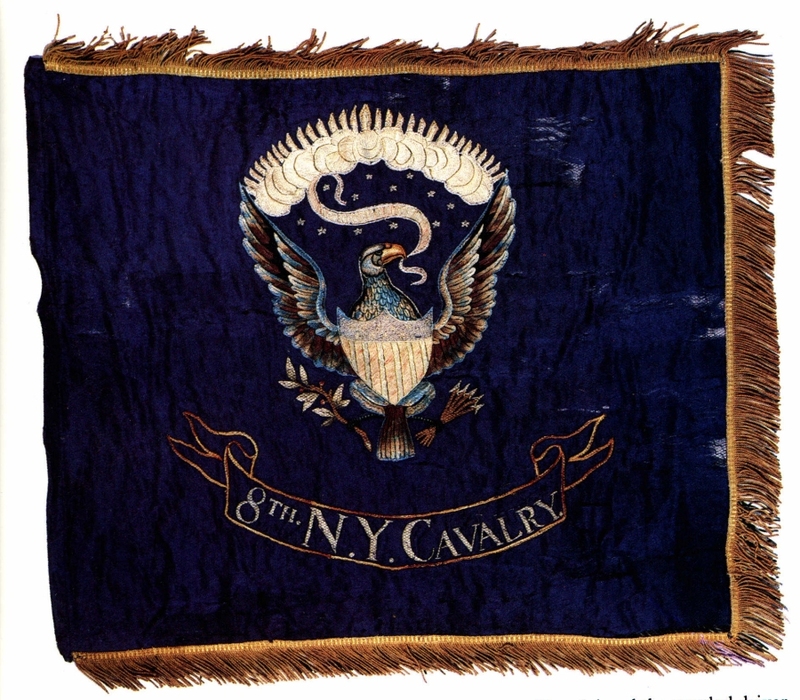 The 8th New York Cavalry was organized in the fall of 1861. “Ten companies were organized, drilled and mustered into the service November 23, 1861. November 28th, the regiment left Rochester for Washington under command of Col. Samuel J. Crooks, where it remained as part of the force in defence of the Capital until March 9, 1862. March 9, 1862, the regiment broke camp at Washington, and was placed on guard along the upper Potomac and canal from Edwards Ferry to Point of Rocks. April 6th, it was ordered to Harper’s Ferry and guarded the railroad from that point to Winchester until May 24th, the time of Banks’ retreat before Jackson, when it fell back to Harper’s Ferry.” The first letter was written during this timeframe. The second letter was written following the Battle of Gettysburg. The 8th New York Cavalry was used to harass Lee’s retreating troops all the way back to Culpepper, Virginia. I received your letter last night. Your letter leaves me in very good health, you may be sure. I have not much news this time for you. I have got a horse and very good saddle. We are a going to make a move very soon. The army is sure to move now. We are again to have an inspection tomorrow. That will be a hard day’s work for us. We will have to mount at 7 o’clock in the morning and it will take all day. It is called a brigade inspection. Well, Mag, I am like yourself. I hardly know what to write about. I have received a letter from Tinie the other day. Laney writes a few lines in it to me. Well, Mag, if I was home now I could not be contented. I would go west of Daniel Mane’s west and he wants you to go with him, go. And if you want any money, I will let you have some. If I get my pay the next pay day, I will send you some. If I come home again, I never will live on Black Street. You can tell mother that if John can’t answer my letter, he may be sure that I can’t write to him. Tinie writes and tells me that she has got her Curtled [?] all arranged for me. I write and tell her that she need not mind. Laney better look out for Pan McNewston [?] peter is not been shot. I seen Johnny and he would know. Mag, you must tell Mary to write to me once and while I like to hear from you all. Well, Mag, your friend Billy Ball ¹ has not come back. Blair has come back. The captain has gone home on a furlough. He asked me if I would be a corporal and I told him that I would not accept of the office. He said that I must accept but I won’t. I must close this time. Direct as follows. To my care, Company K, D. J. Mc. ¹ William Ball—Age, 18 years. Enlisted, August 30, 1862, at Caledonia; mustered in as private, Co. K, August 30, 1862, to serve three years; prisoner of war, since March 1, 1863; transferred to Co. F, November 1, 1864; mustered out, June 6, 1865, at Alexandria, Va. I take the opportunity of writing you a few lines to let you know how I feel. I received your letter a few days ago. It found me enjoying very good health and strength. We are having very good times at the present time. The boys in camp has nothing to do — only keep their arms in good order. I am out at a house safe guard about two miles from the regiment. I have plenty to eat and a good bed to sleep on. The folks is very clever. There is two nice young girls and they are full of fun. One of them tells me that she is a going home with me after the war is over so you can expect to see us this fall. The weather is very warm and dry. The fever is very bad here. There is a great many sick in camp. One of our best boys was taken sick and he only lived five days. ¹ That was all the time that the doctor excused him. Well Mag, I just got up from my dinner. I have had a very good meal. There is two of us here now. We don’t have anything to do — only keep them out of the corn and house. The girls pretend to be scared of the soldiers. Well Mag, I have not much news to tell you. I must tell you about my horse. When I came here I had a very poor horse but I have traded with one of the 8th Illinois and got a very good horse. He is a very nice horse and very smart. He is the best horse that I have had since I came here. I wish you would write and tell me what John is doing and how mother is and how Daniel Christie is a going to do — whether he is a going West or not. If I ever get home, I think that I will go West. I hardly think that I will make my home in Caledonia. I have learnt something since I have come down here. I can find very clever folks all over the world. One thing they hain’t as proud as they are in that part. I must close this. Be sure and write me a long letter as you can. Write soon. Give all the girls my best respects and keep a share for yourself. I am a going to write to mother very soon. From your friend and brother. ¹ This was likely William McNaughton of Wheatland who served as the Commissary Sergeant of Company K. He died of typhoid fever in early September 1863.